You can either make a booking directly on this website by using the "check availability box" to the left. Or you can call our office at 801.648.7332 and a reservationist will be glad to help you. Unfortunately, according to the community HOA rules and regulations, we are unable to allow pets at this time. If you have a service animal and can submit the proper certification to us for our HOA Board, you are more than welcome anytime! You can call our office at 801.648.7332 and a reservationist would love to help find a home that is just right for you and your pet. Our vacation homes are stocked in such a way that you always feel like you are coming "home" to your "vacation home" rather than returning to a small hotel room. Our homes have full kitchens, some homes having game rooms, private hot tubs and BBQ grills. This provides the luxury of being able to enjoy a full service home rather than a simple hotel room. How close to the ski resorts are your vacation rentals? With exclusive access to Powder Mountain Resort, we are proud to offer several ski-in/ski-out on-mountain luxury homes! Located at 8500’ with easy access to the Village Lift, these homes are right in the middle of all the action and have endless untouched powder steps away from the front door. Additionally, we have the largest rental pool of condos and townhomes located in Eden, UT, just a 10-minute drive from Powder Mountain, a 10 minute drive to Nordic Valley, and approximately 30 minutes from Snowbasin Resort. Do I need a vehicle for my stay? We do recommend having a vehicle during your stay. Whether you stay in our ski-in/ski-out properties or down-mountain in our townhomes and condos, you will most likely want a vehicle to get to the grocery store, restaurants, and to the resort. Eden is a small mountain town and does not have a lot of public transportation. There is a shuttle run by the State of Utah that stops in the condo community, but it follows a pre-set schedule. If you need to rent a vehicle you can do so at the Salt Lake International Airport. Click here to see details on our discounts and partnership with Enterprise Rent-a-Car. Are there grocery stores, shops, and restaurants near your vacation rentals? When staying with us in Eden it is just a short drive to Valley Market Grocery, several resturants, and Eden Center, a small congolmorate of gift shops and eateries. The most popular restaurant in Eden, Carlos and Harley's, which boasts a multiple large screen TV's, amazing margaritas, and tex-mex food, is only 5 minutes away. 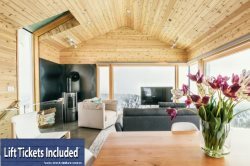 If you prefer the luxury ski-in/ski-out homes, you'll want to stock up on groceries before heading up, as once you are there it is just you, untouched ski runs, and mother nature.